NEW! PINK! Protective Leather iPad Case with Snap Flap for Security and Ease of Use. BUILT IN KICKSTAND great for Movie Watching and Book Reading!! 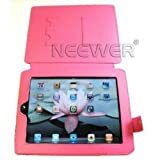 Product Description New generic Leather Case for Apple iPad Material: High Quality Eco Friendly Synthetic Leather Color: Pink Custom made for Apple iPad Keep your iPad scratch free with this synthetic leather case. Protect your iPad against shocks, damage, dust and particles. Durable synthetic leather exterior protects the device, while its soft interior safeguards and cleans the screen The easy slip-in design ensures that your iPad goes in and stays in place for protection. Auto-securing strong snap flap for the best combination of security and ease of use. Unique design allows easy access to all functions without having to remove the case. With a metal kickstand to prop up the iPad, you can watch movies or read ebooks comfortably.